Canon has launched three new high-end Pixma printers with a strong focus on design features - the Pixma iP7250, Pixma MG5450 and Pixma MG6350. The Canon Pixma MG5450 and Canon Pixma MG6350 are compact all-in-one photo printers with Wi-Fi connectivity, two paper feed trays and faster print speeds. 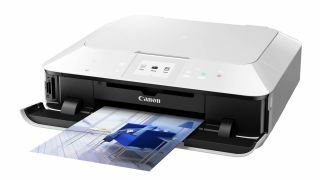 The Canon Pixma iP7250 is a document and photo printer that replaces the iP4950, with faster print speeds and Wi-Fi connectivity, and support for tablet and smartphone printing, as seen on the Canon Selphy CP900, which was also announced at Photokina 2012 today. All three printers can be used with Canon's high capacity XL ink tanks, which provide up to two times more prints per tank compared to standard size ink tanks, saving money if you print a lot. Wireless connectivity enables all the printers to be shared by multiple PCs, tablets and smartphones, and enables you to print directly from PictBridge compatible digital cameras, such as the new Canon PowerShot S110. The MG5450 and MG6350 additionally support Pixma Cloud Link, which includes Google Cloud Print, enabling you to print Google Docs or Gmail attachments from your smartphone, tablet or laptop. Pixma Cloud Link also enables you to directly access online photo albums and print templates, such as calendars. The Pixma iP7250 is Canon's first single-function printer with Wi-Fi. It has a five-ink system and quotes A4 (US letter) ISO ESAT print speeds of 15ipm for monochrome and 10ipm for colour. Canon's Pixma MG5450 is an advanced All-In-One photo printer with a 7.5cm TFT display and five-ink system. Quoted A4 ISO ESAT print speeds are 15ipm for monochrome and 10ipm for colour. A premium All-In-One Photo printer, the Canon Pixma MG6350 features a six-ink system, including a grey ink for quality greyscale prints. It also features a 8.8cm colour touchscreen display with Canon's intuitive Intelligent Touch System for simple navigation. High quality print speeds, according to Canon, are around 15ipm for monochrome and 10ipm for colour A4 ISO ESAT prints. The new MG6350 will also be available in white. The new printers also all feature Auto Power Off, to save energy if they're idle for a set amount of time. They then turn on automatically when a print job is sent to them. All three Canon printers come with Canon's latest My Image Garden software, and photos can also be printed using Canon's new Print Your Days Facebook app. The Canon Pixma iP7250, Canon Pixma MG5450 and Canon Pixma MG6350 will be available from November 2012, with pricing to be confirmed.